Greg Fraser (vocals. guitar) and Stevie Skreebs (Bass, Vocals) of 80s Hair Metal legends Brighton Rock, carry on where they left off, party hearty good times with no apologies. Greg Fraser was the main songwriter in Brighton Rock and Fraze Gang picks up exactly where he left off; party anthems full of big choruses, hooks, harmonies and no apologies for having a good time. With the advent of Guitar Hero and Rock Band, there's been a rediscovery of the craft of classic rock songwriting and the hook laden party anthem; straight up riffs, solos, singalong choruses and the inevitable urge to party on the spot. In the late 80s, big hair and heavy guitars were the staple of a big rock sound. While groups like Van Halen, Motley Crue and Bon Jovi were ripping up the charts in the U.S., Greg Fraser and Stevie Skreebs were unleashing their own vibrations in Canada with their legendary band, Brighton Rock. Before long, Brighton Rock was touring throughout the world entertaining sold out concerts, and carving their niche in rock history. As main songwriter, lead guitarist Greg Fraser racked up enough hits to earn the band 3 Gold albums and MTV (and Much Music) video play. But when the big guitar sounds of the 80s were replaced by grunge, Brighton Rock founders Fraser and Skreebs decided to take a break from the limelight and took that opportunity to recharge their batteries and change up their game plan. Like any good vacation, the break has resulted in a fresh new sound, a rocking charge of music quite unlike anything else they've done before. 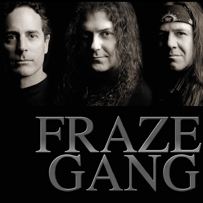 The rebirth takes shape in a brand new band; Fraze Gang. Fronted by BR lead guitarist & vocalist Greg Fraser with help from his partner in crime BR, bassist Stevie Skreebs, and rounded out by powerhouse drummer Phil Epp. Their indie CD (sold only at gigs) garnered so much buzz in the metal underground that Ralph Alfonso, who helped manage Brighton Rock in the 80s and now owner of Bongo Beat, decided it was time the label got back to its rock roots and created a "Hard Rock" series just for the Fraze Gang release. "To be honest, I really missed the great positive energy of being with a hard working rock band and especially Greg and Stevie - we lived inside a tour bus together for years and Greg is still one of the great classic rock writers. Nothing really to explain, just crank'er up, and rock." Fraze Gang are here to keep the dream alive!